Who can join a KiwiSaver Scheme? ​Anyone can join a KiwiSaver Scheme as long as they are under 65. However, you must be living or normally living in New Zealand, be a New Zealand citizen or have permanent residency. If you are over 65 and already a member of a KiwiSaver Scheme then you can transfer to us too. There are generous government incentives for everyone; including children, students, employees, self employed, not employed, stay at home spouses and beneficiaries. I don’t think I can afford KiwiSaver contributions, why do I need to save for my retirement? There are generous government incentives on offer that should not be missed out on. Especially the HomeStart grant of up to $5,000 ($10,000 for new builds) and the $521.43 Government Contribution per year (for every $1 you put into your KiwiSaver account, the government will put in 50 cents up to a maximum of $521.43) if you meet certain eligibility criteria, including being over 18. Life expectancies are continuing to increase and most people will live well past the current retirement age of 65. Planning to live off New Zealand Superannuation alone may not allow you to enjoy your retirement or the lifestyle you are currently used to. NZ Super as at 1 April 2018 is $400.87 per week for a single person living alone or $616.72 per week for a couple (before tax). If you’re hoping to maintain your current lifestyle when you retire you need to start making plans to start saving now. For example: If you’re earning a salary of $60,000 a year (pre-tax), you will generally need two thirds of your salary for each year of your retirement ($40,000) before allowing for inflation. NZ Super is only around $23,058.36 per year for an individual or $34,916.96 per year for a couple (before tax). If you are employed, please use our contributions table to see what contributions you will need to make toward your KiwiSaver account. If you can't afford the contributions from your pay, you should not join a KiwiSaver scheme. If you are already in a KiwiSaver scheme and are having trouble making contributions, please see the Savings Suspension FAQ section below for information about possibly stopping your contributions. We can also recommend a budgeting service that may be able to help you. What information will I receive about my KiwiSaver account? You can access daily fund prices here on our website and keep up-to-date with monthly ‘plain English’ email newsletters, annual reports and audited financial statements. Our members also have private login details to our website so they can always view the full details of their investments, including how much they have saved and transaction information. 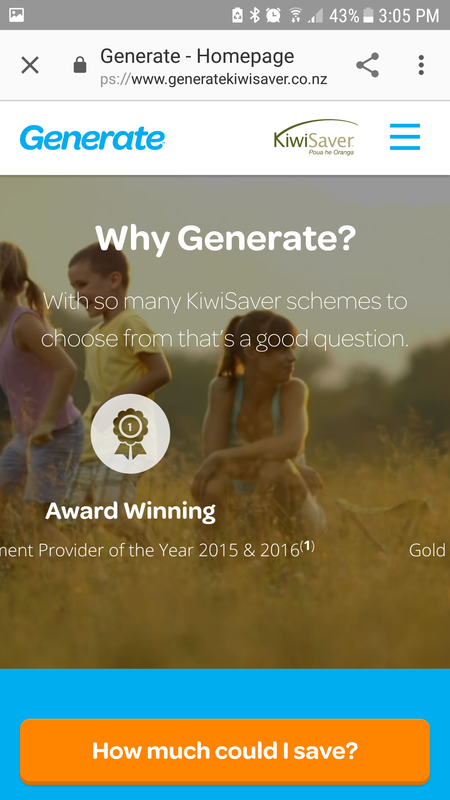 You can contact one of our Generate KiwiSaver Scheme specialists anytime at contact us or by phone on 0800 855 322. ​As the Trustee, Public Trust has full oversight of your KiwiSaver investment. Public Trust is New Zealand's most enduring trustee organisation. It’s the only Crown entity that acts as a trustee serving the corporate and business market in New Zealand. Providing corporate trustee services to some of the best known names in the finance and investment industry (both locally and internationally). Public Trust’s role is important, as it is the supervisor of your investment in the Scheme. Public Trust does not guarantee the performance of the Scheme or any of the Funds. The Generate KiwiSaver Scheme will be audited every year, currently our auditor is Grant Thornton New Zealand. Grant Thornton is one of the world's leading organisations of independent assurance, tax and advisory firms. Grant Thornton New Zealand operates from three locations in Auckland, Wellington and Christchurch, with 32 partners and more than 240 professional and management services staff. What is active management of my investments and why does Generate do it? We believe that international investment markets are not perfect. Too often human nature, including fear and greed, will drive investment decisions. This creates a market where someone may want to buy or sell assets at a price below or above their fair value. Active management aims to take advantage of those situations. Active managers rely on analytical research, forecasts, and their own judgment and experience in making investment decisions on what securities to buy, hold and sell. The opposite of active management is called passive management, better known as "indexing", where an investor simply buys a proportion of all the shares in an index, like the NZX50, and will receive the same return as the market. We have identified market-leading investment managers who have all fashioned outstanding track records over a long period of time. We invest in funds that have substantial funds under management and are run by well-resourced teams of investment managers and research analysts located around the world. Importantly, some of our managers seek positive returns from rising and falling asset prices. After all, the Global Financial Crisis was a timely reminder that asset prices don’t always go up in value. All investments have different levels of risk. For information on the risks see the Generate Product Disclosure Statement or Generate KiwiSaver Scheme Risks below. I am having trouble understanding the fees, can you explain them further? The Product Disclosure Statement sets out the risks of the Scheme. Some of these are listed below. The funds invest in different classes of assets, each with different risks attached to them. Funds that invest in shares will generally have higher levels of risk attached to them. For all assets there is the risk that the asset will not perform to the target rate of return and your returns will be lower than anticipated (or even negative for a period of time). Changes in the tax rates and tax rules of New Zealand and in countries in which investments are made by the funds could adversely affect your investment. In addition, changes to the KiwiSaver regime and government incentives could adversely affect your investment. Investment markets are affected by a range of social, political and economic factors, in both New Zealand and internationally that may impact share prices, property values and interest rates, which could adversely affect your investments. If the assets of a fund become illiquid then the fund may be unable to sell those assets which would affect that fund’s ability to make payments on time. Derivatives may be used as a risk management tool by the funds and IEMs and as an alternative to investing in a physical asset by the IEMs. Derivatives may not perform as expected and may result in increased volatility and unexpected gains or losses. The Growth Fund and Focused Growth Fund both invest in IEMs. Some of the IEMs that these funds invest into may also use commodities, derivatives, currencies, fixed interest and other securities to help them achieve their investment strategies. Most of these managers are able to suspend withdrawals from their funds in limited circumstances. This could result in the funds being unable to make payments on time. When the funds invest in international investments foreign currency movements could affect the investment performance of the funds. We actively manage the Foreign Exchange Risk and typically enter into foreign exchange transactions, a practice known as ‘hedging’. Does Generate have an Anti-Money Laundering/Countering Financing of Terrorism process? ​We take our Anti-Money Laundering/Countering Financing of Terrorism responsibilities very seriously and as a result have put in place robust processes and procedures so that Generate can play its part in this important endeavour. 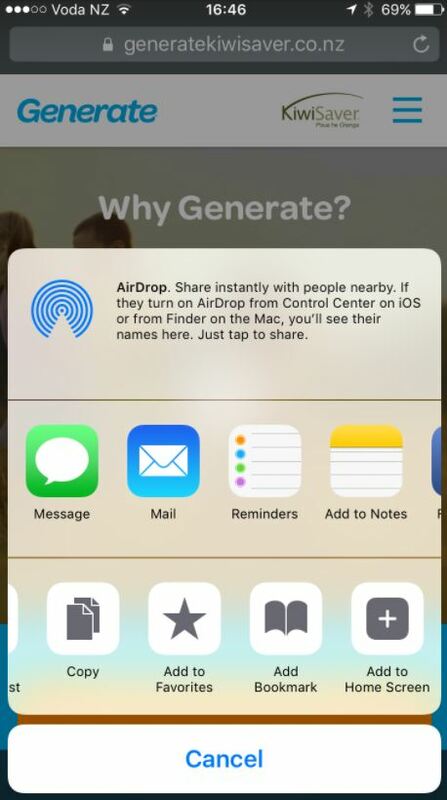 iPhone: How do I add the Generate website to my phone home screen? 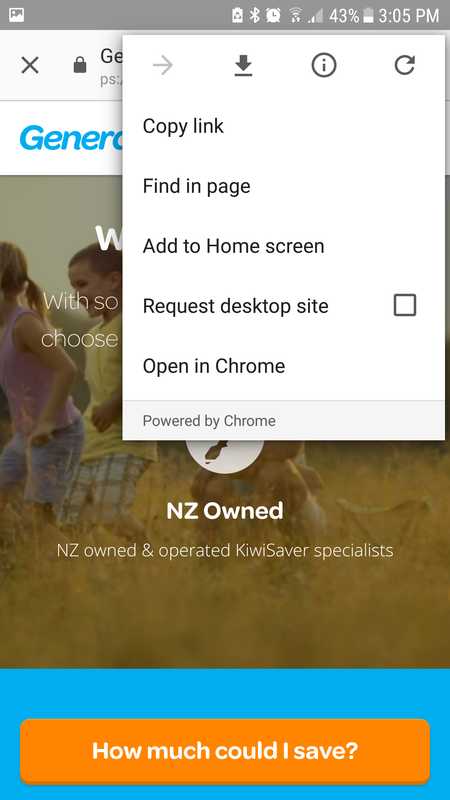 Step 1: Open the Generate homepage (www.generatekiwisaver.co.nz) on your phone browser. On iPhone you need to use Safari. Step 2: Click the 'sharing' icon which is the box with the arrow at the bottom of the page on Safari. Step 3: Find the 'Add to Home Screen' option. On iPhone this is on the bottom row of options, you may have to scroll to the right. Step 4: Save with the title 'Generate'. It may auto-populate as shown below in which case you can just delete '- Homepage'. Step 5: If the Generate 'G' shows up on the phone home screen then you are done! 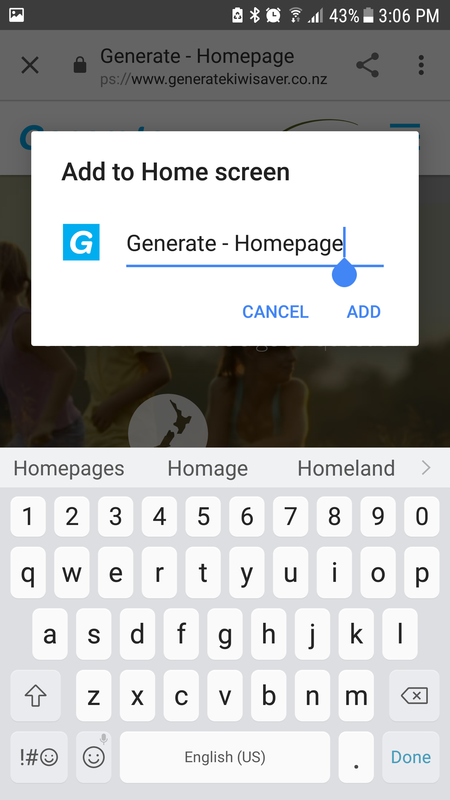 Android: How do I add the Generate website to my phone home screen? 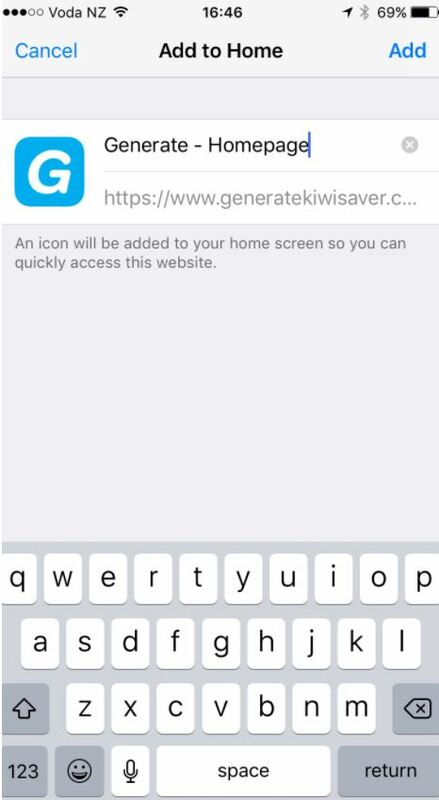 Step 1: Open the Generate homepage (www.generatekiwisaver.co.nz) on your phone browser. On Android common options are Chrome or Firefox. 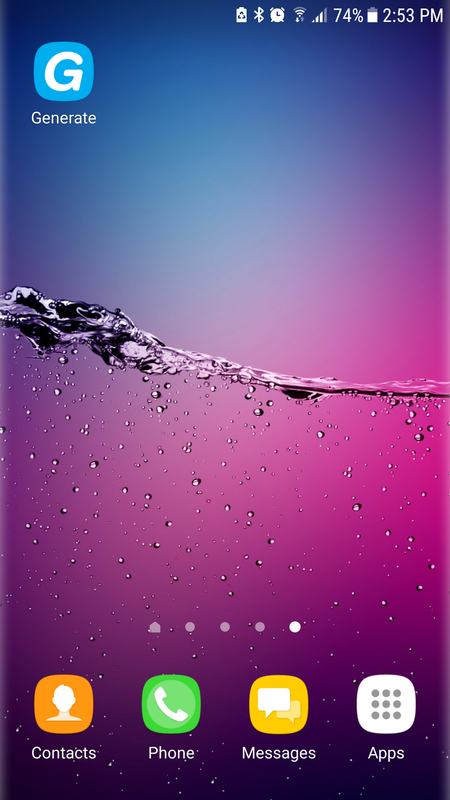 Step 2: Click the 'Add to home screen' option which is in the menu which drops down from the top right of the screen. Does Generate have a Responsible Investment policy? Yes we do and you can read it here Generate Responsible Investment Policy. We are also a signatory to the United Nations Principles for Responsible Investment. Can my children join? How do they do that? ​Yes, everyone under 65 who is living (or normally living) in New Zealand, and is a New Zealand citizen or permanent resident can join, and we welcome children. It’s a great way to save for their first home and to teach them the importance of saving along the way. However, since the Government removed the $1,000 kick-start contribution there are no incentives for children under 18 to join. If you are not making contributions to your child's account then KiwiSaver is not recommended for under 18's. Is your child aged 16 or 17? – If your child is already a member of a KiwiSaver scheme, or is married, in a civil union or de facto relationship, then they can sign alone. – Otherwise both your child and one of their parent(s) or guardian(s) are required to sign the application. – Your child will need to verify their identity. Identification is also required for the parent or guardian if they are required to sign the form with your child. – Your child will also need to provide their IRD number. Are you aged 15 and under? – If your child is becoming a KiwiSaver member for the first time, both of their parent(s) or all of their guardian(s) are required to sign the application. – If your child is already a member of a KiwiSaver scheme, one of their parent(s) or guardian(s) can sign if they have consulted and are acting in agreement with the childs other parent or all of the childs other legal guardian(s). – Your child will need to verify their identity. Identification is also required for the parent(s) or guardian(s) who are signing. I am a stay at home mum/dad. Can I join and do I receive any KiwiSaver benefits? Yes, everyone under 65 who is living (or normally living) in New Zealand, and is a New Zealand citizen or permanent resident, can join, and we welcome stay at home mums and dads. You will get exactly the same benefits as anyone who is self employed or not employed: up to $521.43 per year Government Contribution (50 cents for every dollar you contribute. To get the maximum Government Contribution you will need to be a KiwiSaver member for the full year and contribute $1,042.86. If you are over 18 but under the Retirement Age (and meet certain other criteria) you may be able to take advantage of the first-home withdrawal opportunity and, if you’re eligible, the HomeStart grant from Housing New Zealand. Everyone should save for their retirement and as a couple it makes sense for you to both contribute to a KiwiSaver Scheme as you may both receive the KiwiSaver benefits and enjoy more for your retirement together. Do I have to tell my employer before I join – how do they know to start making KiwiSaver contribution deductions from my pay? ​Once we have processed your application we will notify the IRD. The IRD will then send your employer a letter telling them you have joined a KiwiSaver Scheme and to start making contributions, how much to contribute and when to start contributing. This process may take time so if you want to avoid any delays please tell your employer you have joined and to start making deductions – if they have any questions they can call us on 0800 855 322 or IRD on 0800 549 472.
Who can certify my ID and proof of address? All KiwiSaver scheme applicants need to have copies of their documents certified by an Approved Person (see the list below) as being a true copy of the original document and that they represent the identity of the applicant or parent/guardian. An employee or agent (including advisers who have agreed to be our agent for this purpose) of Generate. related to you, e.g. a parent, sibling, child, aunt, uncle or cousin. "I certify this to be a true copy of the original document and confirm that it represents the identity of (full name of applicant or parent/guardian)." This certification can also be made on the application form under Certification of Identity in the Adviser information section. Certification must have been carried out in the 3 months prior to the presentation of the copied documents. If you already have certified documents within this time frame, they will be acceptable. Certified copies must be entirely legible and the photos clear. What is a PIR and how do I know what my PIR is? Your PIR is your Prescribed Investor Rate which is the tax rate applied to any income attributed to your Generate KiwiSaver Scheme account. 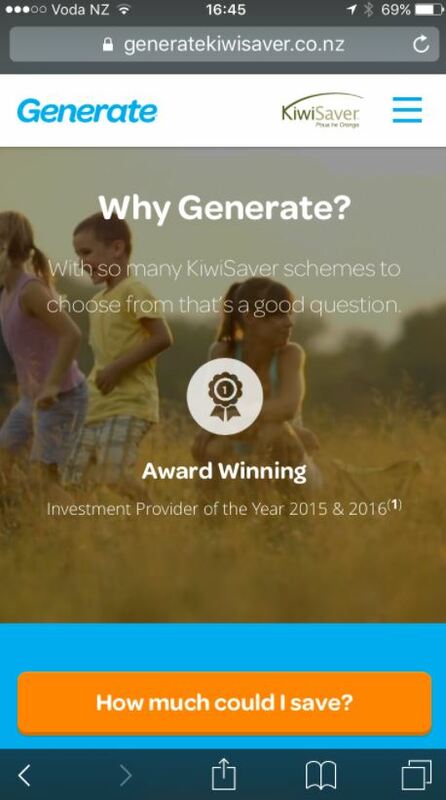 Because the Generate KiwiSaver Scheme is a Portfolio Investment Entity (PIE) we calculate and pay the tax owing from your KiwiSaver account for you. This makes it easy for you and we will send you a tax statement every year setting out how much tax you have paid. Your PIR tells us at what rate we should pay the tax on your account. The PIR rates are different from your normal income tax rate so if you don’t know your PIR, you need to find out. Either ask your accountant, call the IRD on 0800 227 774 or please see our page Working out your Prescribed Investor Rate (PIR). You can also go to the IRD website for more information. It is important to get your PIR right. Please tell us as soon as possible if your PIR changes. If your PIR is too low you may have more tax to pay and if your PIR is too high you may end up paying too much tax from your KiwiSaver account which you will not be able to get back. ​“Most investment professionals agree that, although it does not guarantee against loss, diversification is the most important component of reaching long-range financial goals while minimizing risk”*. The simplest example of diversification is provided by the proverb "Don't put all your eggs in one basket". Dropping the basket will break all the eggs. Placing each egg in a different basket is more diversified. There is more risk of losing one egg, but less risk of losing all of them. Our strategy spreads the risk of investing accross a number of investment managers, investment strategies and markets. We further diversify your savings by combining property, infrastructure, fixed interest and cash assets with our chosen investment funds to create our Growth Fund. 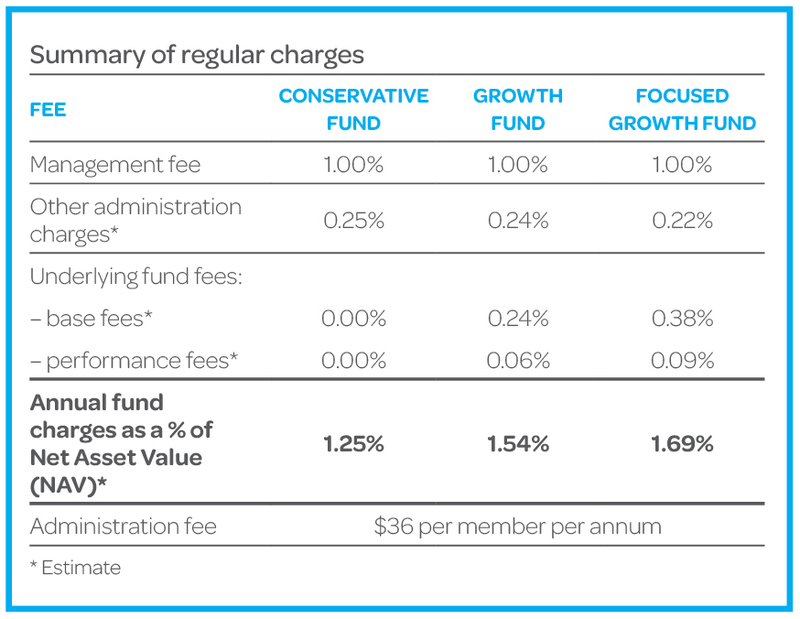 The Focused Growth Fund is similar to the Growth Fund except that it has a higher weighting of International Equities Manager investments and no fixed income investments. We alos offer a conservative Fund that invests only in these same property, infrastructure, fixed income and cash assets. If you are an employee, you can choose to put in 3% (the default rate if you don’t make a choice), 4%, 6%, 8% or 10% of your Before Tax Pay. The amount of your contributions is deducted from your after-tax pay. What about my employer’s contributions? ​In cases where you are employed, over 18 and yet to reach your Retirement Date, your employer will top up your contribution with a contribution at the minimum employer rate, currently 3% of your Before Tax Pay. Employer Superannuation Contribution Tax is deducted from employer contributions. People who are self-employed, not employed or under 18 and not employed can choose how much they want to put in and when. Do I have to contribute or put in money when I join? If you are self employed, or not employed, there is no minimum initial investment. It is your choice to contribute and a good way to do that is by direct debit. You can fill out a Generate KiwiSaver Scheme Direct Debit Form with the application. If you are employed, you will have to contribute 3%, 4%, 6%, 8% or 10% of your gross salary or wages. If you contribute, your employer generally will also contribute 3% (if you are over 18 but under Retirement Age and meet certain other criteria)*, and for every dollar that you pay into the Generate KiwiSaver Scheme up to $1,042.86, the government will contribute $0.50c (up to a maximum of $521.43) (see Government Contribution if you are over 18 but under Retirement Age and meet certain other criteria)*. If you are employed and you do not want to continue contributions to your KiwiSaver account you may be able to go on a savings suspension for up to 1 year. You can choose to start making contributions again at anytime. On a savings suspension you do not have to contribute to your KiwiSaver account. However, in this instance you will not receive the Government Contribution or your employer’s contribution. (You can still receive the Government Contribution if you make voluntary contributions - not out of your salary or wages - while you are on a savings suspension). *Conditions apply – see the Product Disclosure Statement for details. Can I contribute to my KiwiSaver account while I am overseas? Yes, however you will not be eligible for the Government Contribution, whilst you are not a resident in New Zealand. If I am made redundant do I have to deduct KiwiSaver contributions from my redundancy payout? ​No. The KiwiSaver Act specifically excludes KiwiSaver contribution deductions from redundancy payouts. What is the significant financial hardship withdrawal? You may be able to make a withdrawal, not including the $1000 Kickstart and any Government Contributions, if the Trustee is reasonably satisfied that you are suffering or likely to suffer from significant financial hardship. funeral costs for a dependant. The Trustee must be reasonably satisfied that you have exhausted other reasonable means of finding money and may limit the amount of money you receive to what it thinks is required. If you choose to make a withdrawal of this kind, you will need to provide a statutory declaration as to your assets and liabilities. To start the process, please call us on 0800 855 322. We will liaise with the Trustee about your application. What is a savings suspension? you are suffering, or likely to suffer, financial hardship (and Inland Revenue has received at least one contribution from you). If a savings suspension is granted based on financial hardship, its duration will be three months (unless Inland Revenue agrees to a longer period). The duration of a savings suspension will otherwise be between three months and one year (unless your employer agrees to a shorter period). Inland Revenue will notify you before your savings suspension ends and you may apply for a new savings suspension. You may resume contributing at any time by giving notice to your employer, requiring the employer to start making deductions from your salary or wages. To apply please complete a Savings Suspension Request Form and send it back to the IRD as detailed on the Form. What is a serious illness withdrawal? You may make a withdrawal of all of your investment from the Scheme if the Trustee is reasonably satisfied that you are suffering from a serious illness. You will need to provide medical evidence to support any request. To apply please download a serious illness application from our website, complete and send it to us or call us on 0800 855 322. We will liaise with the Trustee about your application. What is a permanent emigration withdrawal? You may withdraw your money from the Scheme (excluding any Government Contributions) one year after you have permanently emigrated from New Zealand (except if you are moving to Australia - see below). Your Government Contributions are repaid to Inland Revenue. Alternatively, at any time after you have permanently moved overseas (except to Australia - see below), you may direct us to transfer your investment (excluding your Government Contributions) to an overseas superannuation scheme authorised for that purpose by regulations made under the KiwiSaver Act. Your Government Contributions in either circumstance will be repaid to Inland Revenue. To do this you will need to complete a statutory declaration stating that you have permanently emigrated from New Zealand. 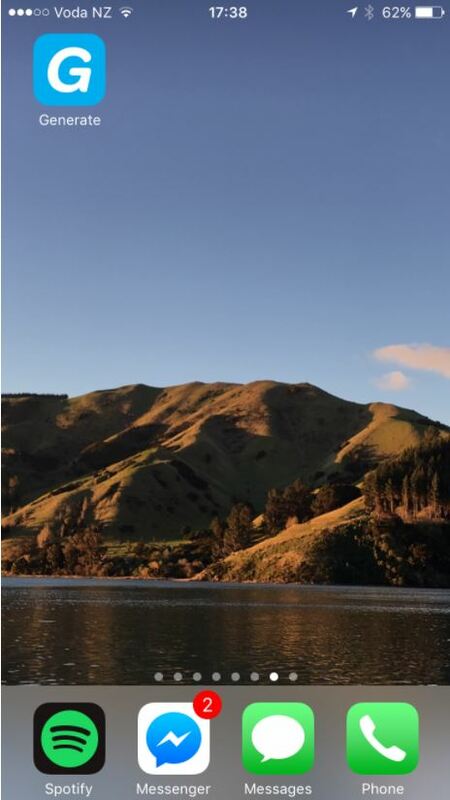 You must also prove to our satisfaction your departure from New Zealand, and that you have resided at an overseas address at some time during the year following your departure from New Zealand. Contact us for more information by email at [email protected] or by calling us on 0800 855 322.
you will be permitted to transfer your full KiwiSaver savings (including the Government Contributions) to an Australian complying superannuation scheme, provided your KiwiSaver savings are below any maximum transfer amount required by Australian legislation. Please contact us for more information about accessing your money when moving to Australia by email to [email protected] or by calling us on 0800 855 322. What happens to my KiwiSaver account if I die? If you pass away, all of your investment in the Scheme will be paid, to your personal representatives on request. This means your KiwiSaver savings will go to the beneficiaries of your estate. For more information please contact us by email to [email protected] or by calling us on 0800 855 322. For your retirement – when you reach the New Zealand superannuation age (currently 65) and have been a member of a KiwiSaver Scheme for at least five years. For your first home - when you make a first home withdrawal. *Some conditions apply. Please contact us for further details by email to [email protected] or by calling us on 0800 855 322. The following people are authorised under New Zealand law to witness statutory declarations made in New Zealand. You will need to sign a statutory declaration in front of one of these people when you apply for a withdrawal such as a first home withdrawal or retirement withdrawal. Generate is able to accept statutory declarations made in Australia and witnessed by someone authorised to do so under Australian law. Please contact us on 0800 855 322 or [email protected] if you have any further questions. Where can I provide feedback on my experience with Generate? If you would like to provide feedback please contact us or call us on 0800 855 322. You may also make a complaint to the Financial Markets Authority. I wish to apply for membership of the Scheme for me, or, where indicated, for my child or dependant. I confirm that I have received, read and understood the current Generate KiwiSaver Scheme Product Disclosure Statement dated 30 September 2018 and agree to be bound by the terms and conditions set out in the Product Disclosure Statement and Trust Deed governing the Scheme. I understand that if a transaction request is invalid or insufficient information is provided, it will not be processed until valid documentation is received. I understand that, if I am a member of another KiwiSaver scheme, my balance in that KiwiSaver scheme will be transferred to the Scheme if my application is accepted. I authorise the manager or supervisor of that KiwiSaver scheme to provide the Manager or Supervisor of the Scheme with personal information about me as necessary to complete the transfer. I understand that neither the Manager nor the Supervisor has represented or implied that any particular fund or investment strategy is appropriate for my particular circumstances. I understand that investments in the Scheme are subject to investment risk and that the value of my investment may rise and fall from time to time. I understand that the distributor through which I joined the Scheme (if applicable) may be remunerated by the Manager for distributing the Scheme. I acknowledge that none of the Manager, the Supervisor and any distributor through which I joined the Scheme will be liable to me for any loss as a consequence of them accepting or acting on instructions from me or an authorised signatory in respect of my membership in the Scheme (and that none of the Manager, the Supervisor, or any other person (including the Crown) guarantees the performance of the Scheme or the repayment of any money payable from the Scheme). I confirm that I meet the eligibility criteria for joining the Scheme as set out on page 6 of the Product Disclosure Statement and that all of the information in this application form is true and correct. I agree to notify the Manager immediately if there is any change in the information given in this application form. By submitting this Application Form I consent to receive all forms of information and communication including account information, confirmation information, newsletters, Scheme annual reports, annual member statements and annual tax certificates by any form of communication including email or other electronic means. I agree, pursuant to the Unsolicited Electronic Messages Act 2007, that the person sending any such message need not include a functional unsubscribe facility in the message. Telephone calls may be recorded for training purposes or to provide security for transactions by the Manager, its related companies or agents. I confirm that I have read and I accept the “Declarations” in the above section. And/Or if submitting on behalf of an applicant under 18, I confirm that I am a legal Parent or Guardian of the applicant. I confirm that I have read and accepted the “Declarations” in the above section on behalf of the applicant. If I am the only person signing as a parent or guardian, I confirm that I am the sole legal Parent or Guardian. If the applicant is aged 16 or 17 and becoming a KiwiSaver member for the first time, only one parent/guardian is required to sign along with the applicant. If the applicant is aged 16 or 17 and is already a member of a KiwiSaver scheme; or is married, in a civil union or a de facto relationship, the applicant alone can sign. If the applicant is aged 15 and under and becoming a KiwiSaver member for the first time, all parents/guardians must sign. If the applicant is aged 15 and under and is already a member of a KiwiSaver scheme, one parent or guardian can sign, provided they have the consent of all of the applicant’s other parent(s)/guardians(s).